An interdisciplinary group of researchers from Norway and Tanzania are working together to understand how environmental, social and political-economic processes affect e-waste flows. The group looks to understand the impacts of anthropogenic toxicants across societies and ecosystems, and to contribute to public debate, policy processes and remedial action. The program, ‘AnthroTox’ is part of a larger research agenda from the University of Olso called Convergent Environments, which brings together diverse groups of researchers to understand complex challenges within health and the environment. Electronic waste is a cumulative global environmental problem. Pollutants coming from electronic waste travel long distances, passively with atmospheric and sea currents, and above all actively with trade in industrial products, second-hand goods, and outright waste. They accumulate in the food chain, affecting animal and human life, including reproduction, immune function, and carcinogenesis. For political, economic and climatic reasons, East Africa attracts large amounts of these hazardous substances, raising questions of environmental justice, and an urgent need for empirical data. By providing toxicological data, as well as better understanding of how electronic waste affect people’s lives, Anthrotox aims to engage with public debates on consumption and production, political economy, ethics and policy concerning environmental pollution. The project findings will contribute to local, national and transnational forms of environmental engagement and activism, and to national and international policy and regulatory processes pertaining to environmental toxicants, as well as critical reflection about these. 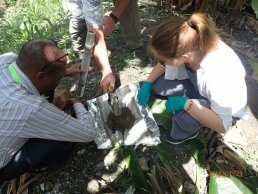 Anthrotox’s initial investigations on pollution from electronic waste in Tanzanian will serve as a sustainable interdisciplinary foundation for further work with diverse collaborators on global anthropogenic toxicants and other toxic substances, across a wider geographical range. A first step towards this broader agenda are the affiliated Anthrotox projects on respectively Aflatoxin and pesticides in Kenya. We invite others interested in critical and creative studies of global anthro-toxicology from across the university and beyond academia to future exchanges, co-operation and collaboration. Read more about the Anthrotox project or get in touch with the University of Oslo through their profile page.